Directions for cake: Preheat the oven to 400° F. the sweet potatoes in 2 or 3 places, set in a small baking dish, and bake for 1 hour, or until the potatoes are very soft and their juices are oozing. Remove from the oven and let cool slightly. The batter comes together more easily when the potato puree is warm. Reduce the oven temperature to 350° F. Butter the bottoms and sides of three 9-inch round pans. Line with rounds of parchment or waxed paper and butter the paper. As soon as the sweet potatoes are cool enough to handle, peel off the skin and remove any dark spots. Cut the potatoes into chunks and put into a food processor. Puree until smooth. Measure out 1 cup sweet potato puree for this recipe. Any leftover is cook's bonus. Sift together the flour, baking powder, cinnamon, nutmeg, and ground cloves. Set these dry ingredients aside. In a large mixer bowl with and electric mixer on medium speed, beat the egg whites until frothy. Raise the speed to high and gradually beat in 1/4 cup of the sugar. Continue to beat until the egg whites form moderately stiff peaks. Bake for 25 to 30 minutes, or until a cake tester or wooden toothpick stuck in the center comes out clean and the cake is beginning to pull away from the sides of the pan. Let the layers cool in their pans for 10 minutes. Then turn out onto wire racks, peel off the paper liner, and let cool at least 1 hour. To assemble the cake, put one layer, flat side up, onto a cake stand or serving plate. Fit a pastry bag with a 1/2-inch plain tip and fill with about 1 cup of the Chocolate Cream Cheese Frosting. 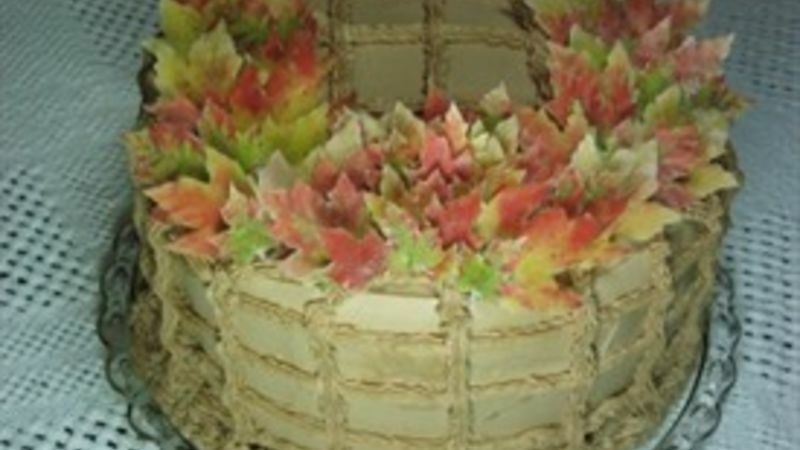 Pipe a border around the top edge of the cake to create a rim. Fill the center with half the Orange Cream Filling, smoothing it to the chocolate border. Place a second layer on top of the filling, and pipe a border of frosting around it. Fill with the remainder of the filling, again smoothing it to the border. Place the third layer on top of all and use the rest of the frosting to cover the sides an top of the cake. Directions for Chocolate Cream Cheese Frosting: In a large mixer bowl, beat together the cream cheese and butter until well blended. Gradually add the confectioners' sugar in batches, sifting or shaking it through a sieve and scraping down the sides of the bowl several times. Beat until the mixture is light and fluffy, 2 to 3 minutes. Measure out 1 cup of the sweetened butter and cream cheese and set aside for the orange cream frosting. Beat the melted chocolate into the remainder of the cream cheese mixture until thoroughly incorporate. Use at once. Directions for Orange Cream Filling: Stir together the sweetened cream cheese and butter, orange juice concentrate, and orange extract until well blended.